Augie Nieto, the Augie’s Quest to Cure ALS’ organization’s leader and namesake, is a fitness industry pioneer and business leader who was diagnosed with ALS in 2005, yet continues to thrive. He is the Chief Inspiration Officer for Augie’s Quest and the Chairman of the Board for the ALS Therapy Development Institute. Known to many as the “Steve Jobs of the fitness industry,” Augie was the founder and retired Chief Executive Officer of Life Fitness and Life Cycle brands, and currently, Augie serves as an operating advisor to North Castle Partners, a private equity firm and is on the board of Curves, Jenny Craig, and Hydromassage, as well. Together with his wife Lynne, the Nietos are the visionary force propelling this important quest galvanizing thousands to join this fight and confront ALS in an entirely new way. Lynne is the “voice’ of Augie’s Quest, and a board member of the ALS Therapy Development Institute. Her leadership, vision and focus on the bottom line, where her accounting background comes into play, have been key to our success. Lynne frequently represents Augie’s Quest with the media and at corporate speaking engagements. Since the organization’s inception, Augie’s Quest has radically changed the way ALS research advances. And, because of Augie Nieto’s business prowess, they continue to drive innovative science forward at an accelerated pace – including one of the most promising drug treatments yet, AT-1501. In collaboration with the ALS Therapy Development Institute, Augie’s Quest has raised more than $120 million, and counting, to find effective treatments and an ultimate cure for ALS. This work is also impacting the scientific community’s understanding of other neuro-degenerative diseases and may lead to a number of advancements beyond ALS. 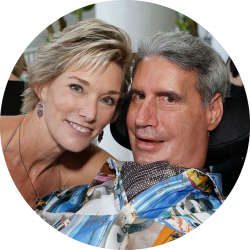 Augie and Lynne, through Augie’s Quest, are committed to bringing ALS treatments to market – and fast. It takes significant resources, billions of dollars to deliver effective treatments to the thousands affected by this devastating disease. With Augie’s Quest, ALS doesn’t stand a fighting chance. Because ALS isn’t incurable, it’s only underfunded.